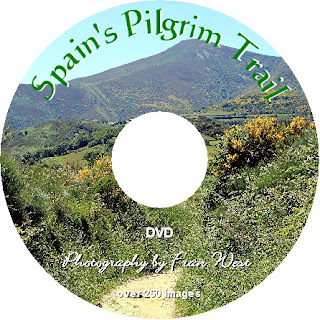 A 26 minute DVD movie presentation of over 260 still photos featuring the last 150 kilometres of the walk from Leon to Santiago de Compostela along El Camino Frances in northern Spain. In this video are most of the things walkers see on a route which meanders through the Spanish countryside taking in buildings, animals, flowers and trees, people, the varied trail, general scenery and a few interesting signs and other bits and pieces. Accompanied by Spanish music soundtrack – no captions or narration, to enable easy viewing and listening, and reminiscence. A real snapshot of rural Spain. Play the preview video. This would be ideal for armchair travel but it will also bring back travel memories for many people who enjoyed walking in their younger days. The symbol for El Camino de Santiago (the Way of Saint James) is the scallop shell and it features on marker posts, fences and other places. The trail itself is easy to follow with yellow arrows guiding people to Santiago. Because both the scallop shells and yellow arrows appear frequently, an activity can be based around spotting and counting how many of these appear in the video. Fran also likes to add a personal touch to her videos. So one of the concrete markers has on it the same number of kilometres to go to Santiago as how old Fran was when she walked along this famous pilgrim trail. Another chance to look and observe while viewing the video. For those who enjoy the outdoors and walking, this video can tie in with Tasmania's Overland Track DVD.